Click here to go directly to the pellet comparison charts. (ii) Why is menadione banned for humans? (iii) Why is it used in animal food? Pellets are a manufactured food similar to dog kibble that is made for pet birds (primarily parrots, canaries, and finches). They are designed to provide complete balanced nutrition, based on our limited knowledge of what this means for pet birds. There isn't much in the way of hard scientific data, but decades of experience and observations by large numbers of avian veterinarians and bird owners indicate that pellets have had a very beneficial effect on the health and longevity of pet birds. There is a small minority of people who insist that pellets are dangerous and unhealthy for birds and should not be used. So far I haven't been able to find a shred of believable evidence backing up this viewpoint. The people holding this opinion are sincere and have good intentions, but this is a personal belief that is not based on science or data. The idea does have emotional appeal however. Pellets are a processed food, and it feels like processed foods ought to be inferior to natural foods even though the available evidence indicates that this isn't true. People with anti-pellet opinions can be very vocal about it, and if these baseless claims scare other people away from using pellets it will be detrimental to their birds. This article will take a look at the reality of the situation. It is generally accepted that for humans and all other animals, there are certain nutrients that are required in certain minimum amounts to sustain good health and life itself. A complete or balanced diet is one that provides an adequate amount of all the nutrients without providing a dangerously excessive amount of anything, and that includes calories. It appears that wild birds and pet birds have very similar nutritional needs except for one item: wild birds need a lot more calories than pets. So a diet that perfectly meets the needs of a wild bird will supply too many calories for a pet if it eats enough to meet its needs for protein and other nutrients, and will not supply enough protein and other nutrients if it eats an appropriate number of calories. See the article on Pet Birds & the Wild Diet for more info. The concept of balance and completeness does not mean that perfect proportions of everything are required at every single meal (although this is what pellets deliver). It just means that nutrients need to be acquired on a timetable that matches the body's requirement for them, so that a specific nutrient is available when it's needed. With some nutrients, amounts that are not needed immediately can be stored in the body for a long time. If an individual has a large amount stored up, it will be a while before they actually need to eat this nutrient again. Other nutrients can not be stored in the body and need to be replenished daily, for example the B vitamins. The protein requirement needs to be met daily too. Protein is made up of many different amino acids, and there are nine specific amino acids that need to be present in the right amount in order to create the complete protein that the body needs. For humans, it has been determined that the body can store unused amino acids for a few hours. So it's not necessary to get all nine at the same meal as long as you get enough of them on the same day. Presumably this is true for birds too, but the window of opportunity might be a lot less than "the same day". Page 362 of Murphy says that a delay of more than two hours might be too late for small birds. To be on the safe side, it's desirable to provide complete protein at the same time instead of providing different types of incomplete protein in bits and pieces at different times of day and expecting it to all add up to what you want. The Protein article has more information on meeting the protein need. There is more than one way to reach the goal of complete balanced nutrition, and the "natural" alternative to feeding pellets is to use a mash recipe that aims for nutritional completeness, or some other blend of foods that meets the nutrient requirements. This is NOT easy to do however, because simply throwing together a variety of healthy foods isn't enough. It will be less deficient than an all-seed diet, but it will still be deficient. It takes a lot of work to feed a truly well balanced diet using only natural foods. You have to know where to get adequate amounts of certain nutrients. You have to know which nutrients compete with each other for absorption (for example calcium and phosphorus) and try to compensate for this. It takes a special effort to meet the need for Omega 3 fatty acids without providing an excessive amount of fat in the diet. You have to figure out how to provide D3 and B12 because these simply aren't available from plant foods. Click here to see the nutrient profile recommendations for companion birds. Most of us don't have the knowledge and skills to plan a diet that meets these requirements on a daily basis. But without this kind of planning, a "natural" diet is almost guaranteed to fall short of the requirement for several vitamins, minerals, and other nutrients. How far it falls short will depend on what you're feeding and how much of any given item the bird eats. Here are some of the pitfalls. Seeds, grains, and nuts in general can not meet the protein needs unless an excessive number of calories is consumed, and they are grossly deficient in Vitamin A. Certain other natural foods can help make up for these deficiencies. For example vegetables provide Vitamin A and the right proportion of beans/legumes will help with the protein problem. It's difficult to meet the mineral need (especially calcium) with plant foods, because many are loaded with antinutrients that interfere with absorption. A meaningful amount of Vitamin D3 is not found in plant foods, with the exception of rimu fruit which is not available outside of New Zealand. Vitamin D2 is only slightly less rare in plants, but it's a moot point anyway because birds utilize it poorly. Do-it-yourself vitamin supplements are risky because excess Vitamin D is stored in the body, and feeding too much can eventually lead to vitamin toxicity. Birds that get outdoors frequently for direct sunlight will make their own Vitamin D, but meeting the Vitamin D requirement is a major problem for indoor birds. Vitamin B12 isn't found in plant foods either, but it's fairly easy to acquire it from the environment. It's created by bacteria in the intestine at a point that's too low for the bird to absorb it. But enough gets passed out of the body that the bird can acquire it by munching on its own poop, and take advantage of the B12 on its second trip through the digestive tract. This may be the reason that poop eating is so common with pet birds. No matter how carefully you balance all the nutrients, your work may be undone if the bird can pick and choose. Fortunately mash recipes that aim for fairly complete nutrition and eliminate the opportunity to pick and choose are available for people who want to do it themselves, such as the ones on the Feeding Feathers group on Facebook. It's hard to meet some of the vitamin and mineral requirements even with a well-planned recipe, but a good recipe will bring you closer to the goal than a random assortment of healthy foods will. Mash and chop are somewhat similar but there's a very important difference: mash aims for as much nutritional completeness as possible and chop does not. Mash is focused on the recipe not the presentation - the combination of foods is what matters, and the ingredients don't have to be mashed up. Chop is a presentation style, not a recipe. Picking and choosing is the very essence of foraging of course, so be sure to include some items in the diet that let your bird exercise its freedom of choice. Studies show that homemade diets often fall short in several major nutrients; there's more on this later in the article. So it's wise to include some pellets in your bird's diet to help insure that all the nutritional bases are covered, and also to aim for a healthy balance in the non-pellet part of your bird's diet. Beaks to Barks has a nice article on the advantages and pitfalls of pellets, along with some discussion of raw diets. The first pellets for birds were invented in the 1970s by Dr. Ted Lafeber, a leading avian veterinarian who was concerned about the widespread malnutrition that he saw in his avian patients (Lafeber: Our Story). The results were so good that the use of formulated diets for pet birds continued to grow, and pellets gained widespread acceptance among veterinarians and bird owners. Technically most of the commercial pellet brands should be called an extruded diet since they are not true pellets. The production process is generally similar, but extrusion uses higher temperatures than pelleting. Extruded foods are more desirable than true pellets because the spoilage rate is significantly lower. But most people use the word "pellets" to describe these foods so that is the word that will be used here. This word refers to nutritionally complete pellets unless specified otherwise. Here's a brief overview of the extrusion process. Moisture is applied using water or steam under pressure to precondition the ingredients. There are a lot of variations in the time and temperature of the preconditioning stage, but the ranges I've seen went from 10 seconds to 5 minutes, and the temperatures went from 176-392 F (80-200C) with most in the range of 248-320 F (120-160C) (Baltivet, Scielo, Reddy, Quang). Lafeber reports temperatures of 250-275 F being used for extruded parrot food, and temperatures of 160-180F for true pellets. Next it passes through the extruder, to be shaped and cut in a process that takes 5 seconds to 2 minutes. Last is the drying/cooling stage. The drying is usually heated because the pellet is much too wet when it comes out. This is the part of the process that's hardest to find information on, but a study of dog kibble (Quang) reported temperatures of 80-200C (176-392 F) and drying time of 43 to 539 minutes depending on the drying temperature and the desired ending moisture level. This is not expected to be a good guide since dog kibble is usually a lot bigger than parrot pellets and would take longer to dry, plus it also contains meat and other ingredients that are not normally found in bird pellets. Pretty Bird reports that their pellets are dried for 40 minutes at 220F. It seems to be generally agreed that both pelleting and extrusion improve the nutritional quality and digestibility of the complex carbohydrates and protein, and helps eliminate antinutrients. Some vitamins will be lost during the process but there are a variety of techniques to ensure that the final product contains adequate vitamin levels. The major brands of conventional (non-organic) pellets were formulated by professional nutritionists to have balanced amounts of every essential nutrient that birds are known to need. They are aware of factors like antinutrients and competition between nutrients, and have compensated for this in their formulation. Most pellets use finely ground ingredients formed into a nugget of uniform texture, so that the bird will get the right balance of nutrients with every bite instead of being able to pick out its favorite bits and leave the other stuff behind. The major conventional pellets include Zupreem, Roudybush, Lafeber, Hagen (Tropican), Higgins (Intune), Kaytee, and Mazuri. Lafeber's Nutriberries and Avi-Cakes are a different kind of pellet; they have the same nutritional balance as regular pellets, but the ingredients haven't been ground up as finely so they look like seed balls or seed cakes that are held together by a nutrient-rich "glue". Caitec Oven Fresh Bites are also a "different" kind of complete pellet that is baked not extruded. The larger sizes have a fairly regular nugget shape, but the small size looks like it was baked in a flat shallow pan and then broken up with a hammer, so the pieces are very irregular in shape and size. This seems to make them more interesting because eating is more of a foraging experience, with different-sized chunks to choose from. It's possible to find other pellet brands but the nutritional quality of off-brand pellets is questionable. Harrisons is the only organic pellet that is nutritionally complete. There are several other brands of organic pellets on the market, but they were NOT professionally formulated and do not aim for nutritional balance or completeness. They contain healthy ingredients and are expected to provide better nutrition than an all-seed diet, and will add variety to the diet if your bird enjoys the crunchy texture. But these incomplete pellets will not safeguard your bird against certain types of nutritional deficiency. The incomplete pellets (including TOPS and Goldenfeast) generally don't contain Vitamin D3 which is essential for calcium absorption and is not available from plant sources. I have a separate article on the Vitamin D issue and ways to deal with it. These pellets often lack Vitamin B12 as well, another essential nutrient that isn't available from plants. Some "nonprofessional" brands use alfalfa as a major ingredient, apparently not realizing that although it looks good on paper, it is poorly digested by birds (Feedipedia under the Nutritional Aspects tab). Incomplete pellets aren't likely to have a good balance of several other nutrients, since this balance doesn't occur naturally in plants and it takes a conscious effort to achieve this balance. They might not even provide complete protein. As this article explains, it looks like there aren't any important differences between organic and conventional food, so your bird will be better off with a complete conventional pellet than an incomplete organic one. It's important to understand that nutritional completeness is a goal not a reality. There has been little research on the nutritional needs of parrots, and most of the information on the dietary requirements of birds comes from extensive research in the poultry industry, which has very different aims for its birds than pet owners do. We can be sure that there are differences between the needs of poultry and parrots but we don't know what those differences are. Dietary guidelines have not been established for a single one of the 350+ parrot species. Furthermore there will be individual differences within a species, so it simply isn't possible to come up with a single food that will be all things for all birds. But there's abundant evidence that the current pellets go quite a long way toward meeting the needs of parrots (Koutsos et al, Ullrey et al, Hess). Several of the major pellet companies are conducting research to refine their formulas and make them even more appropriate for pet birds. Since there isn't a uniform definition of what nutritional completeness means for a parrot, there are nutritional differences between the different pellet brands. There are charts at the end of this article illustrating some of the differences. If you offer more than one brand, it will help average out the differences between them and will also give your bird the power to make a choice between the different options. Most pellet companies will tell you to feed a diet of 80% pellets, and some will go as high as 100%. But they obviously have a financial interest in promoting high levels of pellet consumption, and many well-informed sources believe that a lower level of consumption is preferable. In theory, these pellets are formulated to meet 100% of the nutritional need when fed as 80% of the diet. But they provide more than the minimum recommended amount for most nutrients (see the charts at the bottom of the article), so a lower percentage will also go quite a long way toward meeting the minimum requirement. The recommended amount for calcium is apparently based on meeting the requirements for egg laying, and an adult bird at maintenance can get by with less (see Calcium article). An 80% consumption level appears to be safe for most birds although higher levels have been linked to health problems (especially kidney disease) in some individuals. The problems will often resolve if pellets are discontinued for a while then reintroduced a lower level of consumption (Clinical Avian Medicine Chapter 16). It appears that high levels of vitamin A and D3 in pellets may have caused some issues in the earliest pellets, but this problem was corrected several decades ago (Harrisons). Some individual birds are sensitive to pellets and don't tolerate them well, possibly due to an allergy to one of the ingredients. Eclectus parrots in particular tend to develop problems with toe tapping and wing flipping on a pellet diet. In some cases the problem can be solved by switching to a different brand, and in other cases the solution is to stop using pellets. But nutritional balance isn't the only factor that needs to be considered. Parrots were designed by nature to forage for a variety of fresh foods, and there's a huge amount of psychological value in being able to eat a variety in captivity. Pellets do a good job of delivering the nutrients but their foraging value is pretty limited, so we have to aim for a good tradeoff between physical needs and psychological needs. If you offer several different brands of pellets your bird will be able to pick and choose among them, providing the appearance of more variety in the diet while maintaining a high nutrition level; but this is more practical for people with several birds than for those with just one or two. Recommendations vary, but based mainly on private conversations it seems like many well-informed sources feel that a diet of 50% pellets will generally be enough to prevent dietary deficiencies if the rest of the diet consists of healthy foods including plenty of vegetables and small amounts of seeds/nuts. Granivorous birds (those who mostly eat seeds in the wild) may be able to handle a higher level of seed consumption. The 50% comfort level is probably based on the study by Hess et al which was a survey of the diets offered by 135 bird owners. They found that birds consuming less than 50% pellets had inadequate intake of calcium and Vitamins A and D. Diets high in human food were low in protein, energy, vitamins and minerals, but they didn't say what they meant by "human food" - are we talking about a wide selection of fruits and vegetables or about pizza and potato chips? Diets high in seed had too much fat and were deficient in A, D, and calcium. Lafeber has a nice summary of the study results. The University of California-Davis is a leader in pet bird research whose experimental flock has been eating a diet of Roudybush pellets since 1985 (Roudybush). I couldn't find any information on what percentage of pellets they feed their flock, but this UCD handout recommends a diet of 50-75% pellets and 25-50% vegetables. Brightsmith reported that Amazon parrots offered a diet of 50% fresh produce, 25% pellets and 25% seed consumed a diet that had too much fat and was deficient in calcium, sodium and iron. A diet of 60% pellets, 22% produce and 18% seed still had too much fat but had acceptable levels of all other nutrients. Birds with a diet of 75% pellets and 25% produce had acceptable amounts of nearly all nutrients. Dr Susan Clubb recommends a diet of 75-80% fruits and vegetables and 20-25% pellets for red-sided eclectus. In this link she recommends a 50:50 proportion of pellets and seeds for cockatiels along with an unspecified percentage of vegetables. I have heard that some vets feel that a diet of 20-30% pellets is appropriate for budgies and they should not eat more than 50% pellets. Likewise, 30-50% pellets may be an appropriate range for cockatiels, and 50-70% may be appropriate for larger parrots. Note: These recommendations are usually based on dry weight. Vegetables and fruits have a LOT more moisture content than pellets, so an 80-20 split based on dry weight is going to look more like a 50-50 split based on total weight. You'd get a similar result if you based it on calories - an 80-20 split based on calories will look more like a 50-50 split based on physical volume. It's the moisture content that does it again. Vegetables and fruits have a lot less calories per gram than grains, seeds and nuts do, because veggies and fruits are mostly water and the other stuff is mostly solid material. Here's some math to back it up. If a food has 11% moisture (which is typical of pellets and dry seeds, nuts and grains), you will need 112 grams of the food to get 100 grams of dry matter from it. Wet foods vary a lot more in their moisture content, but 80% is a reasonable average for most fresh fruits and vegetables. At this moisture level, you would need 500 grams of the food to get 100 grams of dry matter from it. To get 100 grams of dry matter that is 50% from dry food and 50% from wet food, you would need 56g of the dry food and 250g of the wet. To get 100 grams of dry matter that is 80% from dry food and 50% from wet food, you would need 90g of the dry food and 100g of the wet. As you can see, the recommendations are all over the place. And one doesn't have to be completely anti-pellet to not feel comfortable with a diet of 50-80% pellets. What's a bird owner to do? You just do the best you can. If you can get some pellets into your bird's diet and some fresh vegetables too, it will be better than if you did nothing. Most pellets are formulated to be meet the recommendations when fed as 80% of the diet. If your bird's diet is 20% pellets, then through the magic of mathematics you have just met 25% of its daily nutrient needs, and whatever is in the rest of the diet will build on this foundation. You should NOT use supplemental vitamin powder with a bird that is eating a large percentage of pellets. Pellets are formulated to meet 100% of the vitamin and mineral needs, and if you add extra vitamins on top of this it can lead to vitamin toxicity (overdose). Most birds are very reluctant to eat an unfamiliar food, so it can be a major challenge convincing them to start eating pellets or mash. This article on diet conversions has tips for encouraging them. Nutritional balance is important for longterm health, but in the short term getting enough calories is far more important than having complete balanced nutrition. So make sure your bird gets enough to eat and don't try to force the issue. Lafeber's Nutriberries are usually accepted more easily than other pellets since they look like seed balls, but they do give the bird the opportunity to pick out their favorite morsels and leave the rest behind. I find that my birds will eat the whole thing if I don't provide too much at a time, but they'll pick and choose if I provide a lot. Some birds prefer whole Nutriberries and others prefer them crushed so they look like loose seed. In general birds tend to prefer seed over pellets, but many birds like Nutriberries better than regular seed. Birds tend to eat regular pellets better if they are served in a separate dish than seed. If the pellets and seed are mixed together in the same dish it's pick and choose time and they'll mostly choose seed. It's reported that birds have a specific appetite for some nutrients including calcium, protein and fat. After your bird realizes that pellets are edible, you may find that it voluntarily chooses to eat some pellets to get some of the nutrients that are lacking elsewhere in the diet. The bird might not eat enough pellets to meet all its nutrient needs if you don't set limits. Birds don't have a specific appetite for EVERY nutrient, and if some nutrients are deficient the bird won't seek them out. But you will have gone at least partway toward meeting the goal. The anti-pellet position mostly boils down to the idea that birds only eat natural foods in the wild so we should only feed them natural foods in captivity. They recommend avoiding pellets completely and feeding a variety of seeds, grains, nuts, vegetables, and other "real" foods. I've never seen any of them recommend that you study up on nutrition so you can plan for a good balance of nutrients; the general idea is that if you provide a variety the balance will take care of itself. Unfortunately this is not the way the real world works. There are some nutrients that are impossible to obtain from plant sources, and others that natural foods don't contain in large enough quantity or in the right proportions. As an example of the difference that nutritionally complete pellets can make, Ullrey et al reported a study on breeding birds from eight parrot species that were fed a diet of seeds, vegetables and fruits for two years and then were switched to a diet of pellets, vegetables and fruits with no seeds. There wasn't a significant difference in the hatch rate of chicks but the fledging rate improved from 66% to 90%. The nutritional status of the parents has a significant impact on the viability of the young, since it determines the quality and quantity of the nutrients that the hen will be able to put into the egg to nourish the embryo, and the quality and quantity of the nutrients that the parents can deliver to hatched chicks. "The diets consumed by free-living birds can rarely be duplicated in captivity because the vast range of seeds and other food items are not usually available in sufficient quantities. Even if these food items, or very similar ones, could be obtained, they may still not be nutritionally adequate. This is because birds usually eat a quantity of food necessary to satisfy their energy needs, and free-living birds have to expend considerable energy to support thermoregulation, extensive foraging, defenses, etc... Thus, the amount of food consumed by a free-living bird is much greater than the amount of the same foods consumed by that bird in captivity. However, the daily need for amino acids, minerals, and vitamins is relatively constant regardless of energy expenditure. Therefore, birds in captivity must acquire the same daily quantity of essential nutrients as free-living birds but with much less food consumed. Consequently, the concentrations (g/kg) of amino acids, vitamins, and minerals must be higher in captive diets than wild diets, and food items that might be sufficient for a wild bird can be inadequate for the same bird in captivity. Additionally, birds in the wild do not always have the nutritional wisdom to select adequate diets. Many animals are able to balance energy, amino acid, and calcium levels in their diets by selecting among dietary items, but there is little evidence that animals can select for adequate levels of many other nutrients." In other words, captive birds need food that has lower calorie density and higher density of other nutrients than the food they'd eat in the wild. But the paper goes on to say that domestic plants have it the other way around. "The nutritional characteristics of food items from domestic plants are often very different from those from native plants. In general, seeds from domestic plants are more concentrated in energy and lower in protein and many other essential nutrients than seeds available in the wild. Likewise, domestic fruits and vegetables are higher in energy and water but lower in other essential nutrients compared with relatives in the wild." Our article on Pet Birds & the Wild Diet has a numerical example demonstrating the problems in trying to make the wild diet work for pet birds. Foods are vehicles that deliver necessary nutrients, and we need to focus on what's being delivered not on what the delivery vehicle looks like. It's likely that many if not most wild birds have nutritional deficiencies, so the wild diet is not necessarily a good example of what the optimal diet would be. Voren says, "There are populations of birds and animals in habitats all over the world that survive and reproduce on grossly deficient diets. All a pair of living things has to do in order to maintain a population is survive long enough to produce two offspring that, in turn, survive long enough to reproduce. Living a long, healthy life has nothing to do with this." Koutsos et al and Klasing comment on the ability of birds to select adequate levels of some nutrients (including protein, calcium and salt) but their inability to select for other nutrients. The wild diet is obviously good enough to keep the species going but it's not likely to be a "perfect" diet that maximizes their life expectancy. The food supply is too variable and unreliable for that. Wild birds have a much shorter life expectancy than pets, largely because so many of them get picked off by predators. But predators prey on the weak, and how many of their victims are weak because of diet deficiencies or diet-related disease? There's no way for us to know. Here are some common complaints from the anti-pellet faction. "There's no such thing as a nutritionally complete pellet because we don't know what nutritional completeness is." This is true. The pellet companies are making their best guess, but it's a much more educated guess than anything that the rest of us can do. BTW a pet food company in the US can't legally advertise their product as nutritionally complete unless it has actually been formulated to be nutritionally complete to the best of our current understanding. There are penalties for violating the truth in advertising laws so lying would be hazardous to their legal and economic health. Incomplete knowledge does not equate to total ignorance and blind guesswork. For every nutrient, there is a range of values that is too little to meet the need and a range of values that is excessive. Between these extremes there is a range of values that will meet the need, and this range can be fairly broad. We may not know precisely what the ideal amount is, or exactly where the boundaries are between enough, not enough, and too much; but we have a very good idea of where the midrange is, and aiming for it will meet the needs of most birds. Because of individual differences, there may be some individuals for whom this midrange value will be too little or too much, but these cases are exceptions to the general rule. We can not identify these cases easily, and most of the time the bird can't identify the problem either. As mentioned earlier, it appears that birds have specific appetites for a few nutrients; for example, if a bird is deficient in protein, calcium or salt it will crave these nutrients and seek them out. But for most nutrients, the bird will not crave them and seek them out if there is a deficiency (Klasing). Providing a lot of different vegetables and letting the bird pick out what it wants is not going to improve on the pellet company's formulation. "The pellet companies are just out to make money." There's no doubt that they want to make money, but selling a crappy product would be bad for their bottom line in the long run. These companies want to keep on making money for a long, long time, and they won't do that by selling something that doesn't actually work. It's too easy for people to talk to each other on the internet, and word would spread about a "bird killer" pellet. Not to mention that the longer your pet lives, the longer you will have to keep buying pet food. Not everybody gets a new pet when the old one dies. The people who sell you any other kind of food or nutritional supplement are out to make money too. That's why there's such a spectacular amount of hype and quackery surrounding anything that can be labeled "natural". "My bird eats only natural foods and is doing just fine." Birds are living longer nowadays because they have better diets, and there's no doubt that adding vegetables to the diet has contributed to this. It can take a LONG time for nutritional deficiencies to have a noticeable effect. Birds can live for years on an all seed diet, which is grossly deficient in several important nutrients. Seeds are nutritious and beneficial as part of a diet that's balanced overall, but like any natural food they don't provide complete nutrition all by themselves and other types of food are needed in the diet. There's no doubt that adding vegetables to the diet will help birds live longer, since veggies add nutrients that seeds don't provide. If the nutrient balance is good enough it's possible that symptoms of serious deficiency may never develop, but the bird's nutritional status and health might be less than ideal due to less severe deficiencies. If pellets are added to the diet to supply nutrients and balance that veggies don't provide, will the birds live even longer? It seems likely that they might. Most pellets have a moisture content of 10-12%, with a few going as high as 14% or as low as 9% (see chart at the end of this article). This is similar to the moisture content of seeds and grains that are commonly fed to birds. The agriculture department at North Dakota State University has an article on the moisture content of stored grain. Table 5 in this article reports that the maximum moisture content should range from a low of 7-9% for flax to a high of 13-15.5% for corn. Millet is 9-10% and oats are 12-14%. Einkorn provides moisture information on a variety of grains ranging from 8% to 13%. Nuts are generally lower in moisture than seeds, grains, and pellets; the University of California reports moisture levels of 5-8% for most nuts, with hazelnuts, macadamias and coconut running higher at 15-20%. 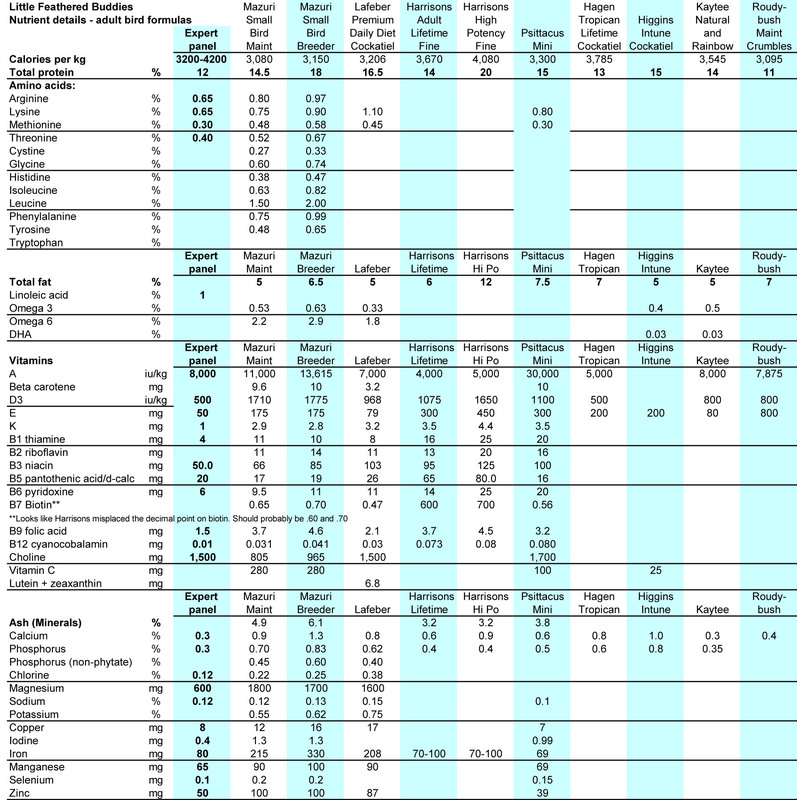 NutritionData runs lower than the other estimates, reporting a water content of 8.7% for millet, 4.7% for sunflower seed, and 4.1% for walnuts. Nature has equipped birds to deal with dry food. Klasing (pg 96-102) doesn't give any figures for the moisture content of seeds and grains, but he describes their hard dry nature and the strategies and physical adaptations that birds need to digest them. When a bird eats pellets and drinks water, the pellets become soft and soggy very quickly. It takes much longer for this to happen with seeds, grains and nuts. "Pellets are too high in protein." Not true. The Expert Panel on pet bird nutrition recommended a minimum of 12% protein in the diet. Typical "maintenance" pellets are 11-15% protein, which is similar to the protein levels in many seed mixes. "High potency" pellets are 18-20% protein. Protein needs do vary by species, and a parrot with a very specialized diet (e.g. nectarivores like lorikeets) might have a very different protein requirement than the average parrot. But Table 3 in this paper by Sales & Janssens shows that a protein level of 10-15% was found to be adequate for a number of commonly kept parrot species. The paper's discussion of protein says that seed diets do not provide adequate protein unless there is supplementation of the first limiting amino acid, which is usually lysine. For a while it was suspected that there might be too much protein in pellets, and a study on cockatiels was conducted to test this idea. It found that they could tolerate a diet of 70% protein for 11 months with no problems (Koutsos et al). No one would recommend that you feed your bird that much protein of course, and the protein level in natural foods tops out at around 40%. But the study indicates that the much lower level in pellets shouldn't be a problem for a typical parrot species. This article on Ariella Avia's Diary is hard on the eyes, but it contains useful information about scientific studies on the protein requirements of birds through 1996. BTW the recommendation for humans is that protein should be 10-35% of the total calories in the diet (WebMD). It looks like the veterinary community is comfortable with a maximum of 30% for birds (Clinical Avian Medicine Chapter 4 Page 89). "Pellets are too high in carbohydrates." Pellets do contain a large percentage of carbohydrates, which is completely appropriate. Because of the way the food-composition equations works, the only realistic alternative would be for them to contain a large percentage of fat, which is undesirable. In any food, protein + carbohydrates + fat = 100% of the calories. And in any well-balanced plant-based diet for a pet bird, the percentage of carbohydrates is expected to be greater than the percentage of either protein or fats. This is partly because the amount of protein in plant foods is naturally limited, and partly due to the need to avoid eating too much fat because it has considerably more calories per gram than carbs do. The calories in high-fat foods add up pretty fast. The calories in high-carb foods will add up too, but not as fast as the fat calories, so an individual can eat more high-carbohydrate foods than high-fat foods without blowing the calorie budget. The Calories & Metabolism article has more information on the interplay between protein, fat, and carbohydrate levels. Many vegetables and fruits are low in calories because they are 80-95% water and don't contain much in the way of fat, protein or carbohydrates. To get enough calories to simply stay alive, it's necessary for the bulk of most birds' diets to consist of more substantial foods that have less water content and more 'dry matter' - the actual nutrients in the food. Most wild parrots eat a lot of seed to meet their energy needs, and pet parrots are given foods like grains, seeds, nuts, and beans/legumes as the mainstay of the diet. As mentioned earlier (and in the Pet Birds & the Wild Diet article), the nutritional needs of wild parrots and pet parrots are similar in most respects, but there's one major exception - pet parrots need a lot less calories. A high-fat diet may be suitable for a wild parrot, but a pet bird on a high-fat diet will use up the calorie budget long before it has met its need for other nutrients. Pet birds need a diet that provides more nutrients per calorie than a high-fat diet can deliver, and a well-balanced diet that is lower in fat and higher in carbohydrates will accomplish this. This is true whether the diet in question is pellets or a good natural-foods diet. Most pet food labels don't state the percentage of carbohydrates, since this information is not required by law. It's fairly easy to calculate though. The article on Calories & Metabolism has information on how to do it. "Pellets use corn which is a cheap filler." Most pellets do use corn and it IS cheap compared to other grains, but it's a mistake to assume that corn has low nutritional value. If you compare any two grains to each other you'll see that one is higher in some nutrients and the other is higher in some other nutrients. But there isn't any grain that is obviously superior or inferior to another overall. Corn is as nutritious as any other grain (Einkorn). It's the best overall plant source of xanthophyll carotenoids which are important to birds (Life Extension, PubMed, McGraw). Corn is easier to grow than some other grains, and is so useful that the US government subsidizes corn farming to make sure that corn is cheap and plentiful. The people who are complaining because corn is cheap are basically engaging in a type of snobbery where it's assumed that something has to be expensive in order to be good. "Pellets use low-nutrition refined grains"
Most pellets use whole grains. "Corn" or "ground corn" on the label refers to whole corn. It's not intact corn since it has obviously been ground up, but the labeling refers to an entire grain of corn that went into the mix without anything being removed (Ask A Vet Question). When partial grains are used there will be additional words on the label indicating this. Pellets do use partial grains sometimes. They have to pack a lot of nutrition into a small amount of space, and sometimes use a higher-nutrition part of the grain such as wheat germ to accomplish their goal. Another example of this is corn gluten meal, a partial grain that is sometimes scorned as inferior by people who don't know any better. It's actually the part of the corn that remains after the sugar/starch has been extracted for use in corn syrup or cornstarch. It's high in digestible protein and metabolizable energy and does not contain true gluten. It's highly appropriate for birds, and one could argue that it's the best part of the corn. (Feedipedia (Nutritional Aspects tab), Ingredients 101, Ask A Vet Question). "This pellet is bad because it contains sunflower and/or peanuts." There's nothing wrong with sunflower or peanuts. They are harmful if fed in excess, but pellets have been formulated to provide an appropriate balance of nutrients with no excess. Low-quality feed-grade peanuts carry the risk of mycotoxins, but the pellet companies use clean human-grade peanuts that reduce the risk to an insignificant level. Peanuts are not the only food that is prone to aflatoxin contamination, but government food inspection policies have generally been effective at preventing problems. The Tree Nuts section of the Seeds, Nuts & Grains article discusses the nutritional superiority of sunflower over tree nuts, and the Peanuts section of that same article discusses the issues with peanuts. "Pellets contain soy and soy is dangerous." An organization founded to promote the consumption of animal products (especially dairy) is waging an aggressive scare-tactics campaign against soy, which happens to be a major competitor for dairy and meat products. Some people have taken the organization's word for it, but the available evidence indicates that the propaganda campaign is highly misleading, and soy is safe and beneficial. The Soy article has more information on the subject. Maybe they do and maybe they don't - there isn't any way to tell. But it doesn't matter, because the anti-GMO hysteria is as baseless and overblown as the anti-soy propaganda. The mutagenesis techniques used to develop new seed varieties for organic crops are a lot scarier. The section on GMO in the Organic vs Conventional article discusses the issue. If you want a complete pellet that's guaranteed GMO-free you need to go with Harrisons, since it is the only nutritionally complete pellet that's organic, and GMO can't be legally used in organic foods. "If you're going to feed pellets it should only be an organic pellet." As mentioned earlier, there don't appear to be any important differences between organic and conventional produce. They seem to be equally nutritious and equally safe. Harrisons is the only organic pellet that is nutritionally complete. Unfortunately Harrisons also tends to be the pellet that birds are most reluctant to eat, probably because it doesn't taste good. I've tasted several brands of bird pellets, and Harrisons would be my last choice if I had to eat one of them as a breakfast cereal. It's like eating chalk. My sense of taste and my expectations about food are obviously different than a bird's, but apparently a lot of our feathered friends agree that it's yucky. Nutritional completeness is more important than being organic. If you prefer organic but your bird won't eat Harrisons, a non-organic "complete" pellet will be better for your bird than an organic pellet that is not complete. There are several brands of non-professionally formulated organic and almost-organic bird food on the market, including pellets, 'unpellets' and other types of mixes. In general these foods are not expected to actually be dangerous, and will be healthy enough as a snack. But they won't provide the nutritional balance that you get from a professionally formulated pellet, and nutritional balance is the entire point of feeding a pellet in the first place. "Non-organic pellets contain additives like sugar, artificial colors, artificial preservatives, and synthetic vitamins." It's true that many of them do contain one or more of these things. Although most pet owners would prefer a pellet that didn't contain these items, the bird's vote is more important than ours. A perfect pellet that your bird won't eat is useless. The sweeteners and coloring in the less-perfect pellets are safe; the amount is small and does not have a significant effect on the nutritional value or glycemic index of the pellet (Nutrition for Pets); and they make pellets more appealing to birds, increasing the likelihood that your bird will actually eat it. Based on my own taste tests, there is a slight hint of sweetness. It's not like eating cookies. Preservatives are essential to prevent spoilage. Most brands use citric acid as a natural preservative, and some use propylene glycol as well since the combination overcomes certain limitations of citric acid alone (Wiley). Propylene glycol is another subject that raises fear in certain quarters, but it is not dangerous and is far safer than eating spoiled food. Its toxicity is very low (ScienceLab) and it does not build up in the body. You would have to chug down a large amount of it in order to do any harm, and it's basically impossible to poison yourself with it through normal food consumption. The FDA allows it at levels ranging from 2% in most foods to 97% for seasonings and flavorings (FDA). They're REALLY convinced that it's safe, although they indicate that it starts to become a problem if it's more than 5% of your total food intake (FDA). The amount in Nutriberries appears to be a lot less than that. Nutriberries look like they're about 99% seeds and grains, and there are several "invisible" ingredients that are ahead of propylene glycol on the ingredient list. Besides its common use in pet food products, propylene glycol is widely used in human food products and personal care items like cosmetics and shampoo (Wikipedia, Naturally Curly). Added vitamins are necessary to achieve the right nutritional balance since some vitamins simply aren't available from plant sources. There are widespread claims that natural vitamins are superior to synthetic vitamins, but in most cases the evidence indicates that they both have the same effect. In the case of Vitamin E natural really is better, in the sense that synthetic E uses a different form which is less readily absorbed. But according to Life Enhancement, synthetic E is substantially cheaper and is more cost effective even though you need more of it to get the same results. They also state that the natural Vitamin E sold in supplement form is mostly extracted from soybean oil and contains residues of the soy phytoestrogens that cause so much fear in certain quarters. The added vitamin that causes the most anxiety is synthetic Vitamin K, aka menadione. This is yet another tempest in a teapot, where rumors of danger are spreading like wildfire about a safe, time-tested ingredient. Menadione sodium bisulfite complex is the only form of supplemental vitamin K approved for dog and cat food by AAFCO, which is the Association Of American Feed Control Officials, a non-profit organization that sets standards for the quality and safety of animal feed. They don't have any official authority but many states have adopted their guidelines. Natural Vitamin K is not approved for use in supplement form because it is unstable and therefore is not reliable enough to use in pet food. Vitamin K overview. Phylloquinone (Vitamin K1) is the natural form produced in green plants, but its bioavailability is low in plant sources because it is tightly bound to chloroplasts. Only 4% to 17% as much phylloquinone is absorbed from spinach as from a tablet (NIH). The phylloquinone in plant oils is more bioavailable (Booth). Menadione (Vitamin K3) is a temporary transitional form that occurs when Vitamin K1 is turned into Vitamin K2 by the body or the gut flora. It does not occur in food because it doesn't have a steady, ongoing existence like the other forms do, but it is a natural precursor to Vitamin K2. That's right folks, menadione is so natural that it's made in your body as part of the normal Vitamin K metabolism process (Okano et al, Hiroto et al). Menaquinones (Vitamin K2) are manufactured by bacteria, in the gut and also in fermented foods, as well as being synthesized by the body. There are 12 different subtypes of K2, which are labeled MK-1 through MK-12. The most important forms of K2 are MK-4 (the type made by the body) and MK-7 (the type made by bacteria). It's thought that the body makes some use of the K2 that's produced by gut bacteria, but this is limited because the intestinal location where it's produced is an area of poor absorption (DSM). Ruminants do a much better job of using this bacterial K2 than other animals, and non-ruminants can take better advantage of it by eating some poop and absorbing the K2 on its second trip through the digestive tract. Reumann says that "humans rely on vitamin K1 uptake from green leafy vegetables as a precursor for the synthesis of its structural derivative, menaquinone-4 (vitamin K2)". The body and the gut bacteria have to make menadione in the middle of the conversion process, because the other forms of Vitamin K consist of menadione with some other stuff added to it. Chemically speaking, menadione is a 2-methyl-1,4-naphthoquinone ring, and this same ring is found in all other forms of Vitamin K (Walther et al). The other forms are created by adding an additional molecule chain to this basic ring. In effect, menadione is the foundation for Vitamins K1 and K2. Vitamin K1 is turned into K2 in the body by removing the original chain of extra material, which creates menadione, then adding a different chain of extra material to the menadione to create K2. When menadione is added to food, the body can skip Step 1 and go straight to Step 2, but otherwise it's the same natural process. I couldn't find a source that said so directly, but it looks like K1 and K2 are pretty much interchangeable when it comes to performing Vitamin K's main function, which is assisting the coagulation of blood. Vitamin K2 may or may not provide some additional benefits that you don't get from K1. You can't buy menadione supplements, but you can buy Vitamin K2 in the form of MK-4 and MK-7 supplements (which are both made from menadione in nature). The alternative community is very excited about the purported benefits of Vitamin K2, but many prefer MK-7 (the type that bacteria produce from menadione) over MK-4 (the type that the body produces from menadione). See the infamous Mercola quack website for example. How ironic that they want you to buy a form of K2 that was manufactured outside the body, but have a meltdown at the idea of consuming menadione so the body can use a natural process to make its own K2. There's some propaganda flying back and forth over which K2 supplement is better, MK-7 or MK-4. But K1 supplement maker Shaklee says that all forms of Vitamin K will provide similar benefits, and you don't need K2 supplements because your body and the bacteria in your gut make it from the K1 you consume. Furthermore, it has not actually been proved that K2 provides additional benefits, and the data on K2 is so limited that the FDA does not even allow it to be listed as Vitamin K on product labels. Shaklee is obviously a biased source, but it looks like their information is correct. It is apparently impossible to overdose on K1, the natural plant form of Vitamin K, while synthetic menadione is toxic in large doses (generally meaning over 1,000 times the normal dose). The same is true of various other vitamins including A and D; you can't overdose on the natural forms (beta carotene or on D made from sunshine), but these vitamins are toxic if you overdose on the synthetic form. Supplements make it possible to get a lot more a lot faster than you would from natural sources, but it's safe if you use an appropriate dose. Oduho et al found that menadione did not cause harm to chicks until the amount exceeded 1,000 times the normal requirement. K1 and K2 are fat-soluble, and the amount of fat eaten along with the Vitamin K makes a difference in how well it's absorbed, in addition to the other factors that interfere with bioavailability. But the form of menadione used in animal feed is water soluble, so it's well absorbed regardless of how much fat is eaten (DSM). Getting enough Vitamin K in the diet may be particularly important for birds. Vitamin Tolerance of Animals notes that different species vary in the degree to which they can utilize the Vitamin K synthesized by bacteria in the gut. They state that "poultry are much more likely to develop dietary deficiency signs than any other species". It's probably safe to assume that poultry are the only birds that have been closely observed and tested, and it's likely that this statement applies to parrots and other bird species. The book also specifies that the dietary requirement for poultry is higher than the requirement for most nonruminant animals. The reason according to DSM is that "Contrary to most animals, poultry have a limited ability for intestinal synthesis, and so adequate dietary supplies are of greater importance. Poultry have a shorter digestive tract for vitamin K synthesis, with a rate of passage faster than for other species." Most of the menadione research is on chickens, but there is a study on lovebirds that says a lot about its safety for pet birds (Wolf et al). The study used three groups of lovebirds that were fed menadione levels of 0, 20 grams, and 200 grams for a period of 10 months. The highest level was an overdose of 85-170 times the recommended level. At the end of the study, all the groups were in a similar state of health, and no toxicity issues whatsoever were observed. The group that got the biggest overdose of menadione had the best body mass development and the best egg-laying performance. The conclusion of the study was that "Given these results, any doubts about the compatibility of usual doses of vitamin K(3) in diets for lovebirds must be considered as absolutely groundless." In other words, it looks like it's perfectly safe even at an overdose level that is significant but not completely insane. Why is menadione banned for humans? The anti-menadione forces will tell you that it's banned because of its toxicity, but the official records tell a very different story. The US bans the use of menadione in human foods and in supplements because the manufacturers didn't provide sufficient proof of safety to comply with the regulations on food additives, which does not imply that it is dangerous. 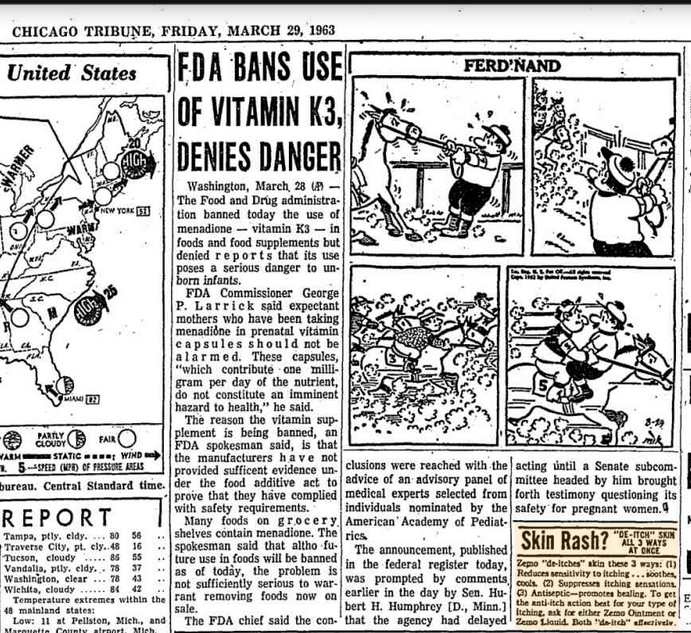 At the time the ban was issued, the FDA paradoxically told people who'd been using it not to worry because it wasn't dangerous at normal doses, and allowed the sale of the existing inventory to continue (click on the thumbnail at left to read the Chicago Tribune's report in March 1963). It's a very strange story. The Squibb company applied for permission to use menadione in prenatal vitamins. The feds turned down the request because its safety in prenatal vitamins hadn't been proven to their satisfaction. Then they went a step further and banned it for everyone else, on the grounds that normal nonpregnant adults didn't require supplemental Vitamin K because they would get enough from a normal diet (Federal Register March 1963 page 3051, Federal Register July 1963 page 7262). Using that line of reasoning, ALL vitamin supplements should be banned. Makes you wonder whether somebody at Squibb did something to piss off the feds so much that they went into 'overkill' mode. Notice how this story disproves the notion that "big pharma" is running the show. Big pharma didn't get the approval that they were looking for in this case. But it didn't hurt them any; all they had to do was make a slight change to their manufacturing process and their product label, and merrily carry on with selling their vitamin supplements without the Vitamin K. If anyone lost out, it was the pregnant women who needed more Vitamin K than they were getting. It looks like the FDA did not start approving synthetic Vitamin K1 supplements (phytonadione) until the 1980s (PharmaCompass), and Vitamin K2 supplements started to appear in the 2000s. To this day there are many human vitamin supplements (both regular and prenatal) that don't include any Vitamin K at all. Prior to the ban, the FDA allowed menadione to be consumed by humans with a limit of 1 milligram per day (Federal Register December 1962 page 12896). ToxNet estimates the lethal dose as being somewhere between one ounce and one pound for a 150-pound person. ToxNet also says that doses up to 200 milligrams have been well tolerated. You can see how conservative the old 1-milligram FDA limit was - the lowest potentially lethal dose of one ounce is more than 28,000 milligrams! Why is it used in animal food? The authorities aren't as fussy about the standards of proof for animals, and menadione's use in animal food is approved by the FDA and the European Food Safety Authority. Safe limits have been set backed up by studies. Menadione has been used in pet food for decades, fed to millions of pets with zero documented cases of toxicity, and is considered to be safe and effective. It's not always required to use it though, even in a "complete" food. My impression from looking at various sources is that the only real requirement for adding vitamin K to pet food is for certain fish-based cat food, and any other additions are voluntary. Some pellet manufacturers have opted to make sure that our birds get this vital nutrient. (SkeptVet, Dogster, Dogfood Advisor, Moon Valley Reptiles, Wysong, Radio Pet LadyLady). Some bird pellet manufacturers add green plants (particularly alfalfa) to their product as a way to get some Vitamin K into their product, but this is not a particularly efficient way to do it. The maximum allowable FDA limit is 2 grams of menadione per ton of complete feed (FDA). There are 987,105 grams in a ton of food, so everyone is freaking out over a tiny, tiny dose. Some of the anti-menadione sources act like the pet food companies are using it because they're evil. But the only reason for using it is to make the food more nutritious. The companies aren't taking a shortcut by using synthetic vitamin K instead of the pure natural form because there are practical problems with natural Vitamin K. The absorption rate from plants is low, and there isn't a K1 or K2 supplement that they can use. Menadione is the only form of supplemental vitamin K that's approved for use in pet food, so if they want to have a reliable, easily absorbed source of vitamin K in the food, the options are menadione or nothing. The menadione doesn't serve any other purpose in the food (for example it doesn't have preservative effects), and in most cases the companies aren't required to have any vitamin K in the food at all. But it IS an essential nutrient, and it may or may not be adequately supplied from other sources. The pet food companies that are using menadione are doing it purely to make sure that the animals don't suffer a Vitamin K deficiency. In the past it was observed that some small parrots from specific species who had certain color mutations were prone to developing kidney problems if pellets were fed as 90% or more of the diet, but the problem resolved if pellets were removed from the diet for a while and then reintroduced at a lower level of consumption. At first it was suspected that too much protein was the culprit, but the previous section explained that this turned out not to be the case. Suspicion then fell on the Vitamin A levels, and many pellet companies responded by reducing the amount of preformed Vitamin A in their product. In any case it seems likely that a genetic weakness in certain mutations in certain species plays a role in the issue. It is probably not the mutation gene itself that causes the problem, but rather another faulty gene passed down from the original founder of the mutation. Although not formally entered into the veterinary literature, there appears to be a form of renal disease induced by feeding predominately pelletized diets to various color variety psittacine birds (M.S. Echols, unpublished data). All affected birds observed by the author have been color variety cockatiels Nymphicus hollandicus), lovebirds (Agapornis	spp. ), budgerigars and parrotlets (Forpus	spp.) and have eaten a predominately commercial pelletized diet. As most of the major brands of commercial pelletized diets have been involved, there appears to be no predilection toward any one manufacturer’s product. With the exception of a history of predominately commercial pelletized diet, affected birds do not display any characteristics pathognomonic for “diet-induced renal disease.” Of the birds with suspected “diet-induced renal disease,” in which the kidneys have been histopathologically examined (pre- and postmortem), lesions have been limited to non-specific tubular nephrosis and were reversible after feeding a non-pelletized diet for 1 to 3 months. The diet should be converted to one appropriate for the species being treated. "I feel like I am at fault with the kidney problems and pellet diets in color mutation birds issue as I published this years ago. To be clear, we only recognized this problem (which has NEVER been further defined) when SOME color variety parrots were fed 90% or greater of their diet as pellets. I commonly recommend that parrotlets be fed 50% or less pellets and the remaining being grains, veggies and a small amount of fruits. Don't forget to get these birds outside (in a safe environment) for some natural sunshine therapy. Dr. Echol's comment was in response to a question specifically about parrotlets, but he has made similar recommendations elsewhere for other small parrot species. This is baseless speculation with no logic or evidence behind it. The conditions that lead to acrylamide formation are not present during pellet processing, so this claim can be dismissed as scare-tactics propaganda until the moment someone can produce a shred of evidence that it's true. Don't hold your breath waiting for that moment to arrive. Acrylamide is a possible carcinogen that often forms when certain foods are heated under certain conditions. However it is not clear whether acrylamide actually increases the risk of cancer (National Cancer Institute, NPR). The World Health Organization and the European Food Safety Authority have expressed some concern about acrylamide, but are not concerned enough to actually do anything about it. Acrylamide is primarily created by the browning of food in a process called the Maillard reaction. The foods that are most prone to acrylamide formation are starchy plant foods that a contain a lot of asparagine (an amino acid). The cooking methods that are most likely to produce acrylamide are deep frying, and baking or toasting at high temperatures for long time periods under low-moisture conditions (National Cancer Institute, WHFoods, New York Times, CBS News). Adding steam reduces acrylamide formation during baking (Isleroglu et al), and it is generally agreed that cooking methods that do not cause browning (like boiling, steaming, and microwaving) cause little or no acrylamide formation. Pellets are steam-heated for short periods at relatively low temperatures. They are then dried at temperatures that do not produce browning. So there is no reason at all to think that they might contain acrylamide. If a tiny amount does manage to form, it is not expected to be a problem. The body can neutralize acrylamide, although large amounts might be too much for the system to handle. It is said that you can support the detoxification process by including cruciferous vegetables like broccoli and brussels sprouts in the diet (WHFoods). Grains do contain asparagine, and low levels of acrylamide are sometimes detected in the brown crust of baked bread. The levels are higher in toast, which has been browned over a larger area. Burning the bread or going for a dark color produces more acrylamide than going for a light color while baking or toasting (Jackson & Al-Taher). But many commercial breads contain no detectible acrylamide (FDA), and any acrylamide in baked bread can be avoided by not eating the crust. The primary concern about acrylamide is with the high level in potato chips and french fries, particularly when the same oil is used to deep fry repeated batches. You shouldn't be feeding these foods to your bird anyway because they're high in fat and salt. Acrylamide does turn up in some surprising places. It's present in cigarette smoke. Coffee and tea often contain it, but it's not from the brewing process - it's because the beans and leaves are dry-roasted after harvest. No one recommends giving coffee to birds, but there is some marketing hype out there promoting tea for birds. If you're worried about acrylamide and want to avoid every tiny trace of it, then stay away from that stuff (Chen et al). If you want less acrylamide in your french fries, insist on fries made with GMO potatoes (New York Times, Forbes). The rest of this article shows the nutritional analysis for several major US pellet brands and the European brand Psittacus. These companies update their formulas from time to time, so it's possible that some of the information below might be outdated. There are far too many varieties to list them all, so I chose to list cockatiel-sized pellets since that's what my birds eat. The Expert Panel recommended minimums are from the Lafeber website. The rest of the 'official' information is from company websites, except for Kaytee who sent me some information by email. Most companies don't publish detailed nutritional information, so the first table just shows the minimum information that they're required to report. It's surprising how much variation there is in the protein and fat content. If your bird has weight issues you might want to consider the fat content when choosing a pellet. This "bare essentials" chart is followed by two more tables showing more detailed information for the few companies that provided it. Any amounts that are less than the Expert Panel recommended minimum are marked with an orange background. Keep in mind that the Expert Panel recommendations aren't the final authoritative word on anything. The expert panel recommendations were made in 1998, after pellets had already been around for 20+ years. Obviously the pellet companies looked at a different standard when they first developed their formula, and the recommendations are almost 20 years old now so current thinking might be different. In these tables, any items that I estimated are marked in light purple. Amino acid requirements were based on scientific sources, and carbohydrate percentages were estimated using the principles in the "Calories & Metabolism" article. "Ash" is the minerals left behind when the organic materials (protein, fat, carbs, and fiber) have literally been burned away. The charts below present the data from the companies that provided a fairly complete nutritional analysis, but the thumbnail at left leads to an expanded chart with additional information on companies that provided more limited information. Mazuri is the only US pellet company that publishes a detailed nutritional analysis for all of their products. Lafeber has published a detailed analysis for their premium daily diet but not for their Nutriberries and other products, which have a different formula and some differences in their guaranteed analysis. So the information below won't be specifically applicable to Nutriberries, but they will presumably be somewhere in the same ballpark. In the charts below, a table cell with an orange background indicates that the amount is less than what the Expert Panel recommended. Quite a few pellets fall short on the Vitamin A requirement, which is probably because the thinking has changed over the years about the appropriate amount of Vitamin A but the Expert Panel recommendations haven't been updated. In any case this can be made up with vegetables in the diet. Based on comparisons to other literature on the amino acid requirements of birds, it also looks like the Expert Panel may have intentionally recommended about twice as much lysine as was actually required, to make sure that there was an adequate amount of this hard-to-get nutrient in the diet. Either that or they're aiming at the requirements of laying hens and growing chicks, which need a lot more lysine than adult birds at maintenance. When necessary, a paper by Werquin et al was used to calculate the calories, and it's possible that this information might be outdated. In addition to the info below, Table 11 of Ullrey et al has detailed information on an extruded diet that was used in a study. Ullrey's information is reported on a dry matter basis while the information in my chart below includes the moisture, and some of Ullrey's information is expressed in different units. Next is a table of handfeeding formulas for babies. There's not as much information available for handfeeding formula, so I don't have an expanded chart. These are standard formulas only; Kaytee, Zupreem and Psittacus also have a high-fat formula that is not included in the chart. I couldn't locate any nutritional recommendations for babies so the Expert Panel recommendation for adult birds is listed for comparison purposes. In general babies are expected to need more than adults, but they eat proportionately more too. It's unfortunate that more companies don't provide detailed information. A study by Cornejo et al investigated the nutritional content of 15 handfeeding formulas and found that many of them were lacking; but the paper disguises the identity of the companies so we can't tell which handfeeding formulas are best and which are best avoided. As indicated by the charts above, there are currently two brands of "extra strength" pellets, Mazuri and Harrisons. As far as I know, there is no controversy at all about Mazuri. The calorie content is very similar to its regular formula while the levels of protein and many vitamins and minerals have increased. It is sold for use as a breeding formula (a time when extra nutrients are needed) not for everyday use. The Harrisons high-potency formula is more controversial. In addition to increasing the protein, vitamins, and minerals, the fat content has increased very significantly, from 6% to 12% in the fine and superfine sizes, and from 5.5% to 15% in the coarse size (Harrisons analysis chart). In the coarse size, this huge increase in fat was achieved by moving sunflower seed from seventh place on the ingredient list to first place, a fact that leaves some people in a tizzy. But sunflower is very nutritious when it's used right. The Tree Nuts section of the Seeds, Nuts, & Grains article shows that sunflower is nutritionally superior to the much-ballyhooed nuts. Harrisons recommends a much wider use for their high-potency formula than Mazuri does. They recommend that all birds being converted to a pellet diet eat the high potency for six months, and also suggest using it as the bird's year-round diet They even recommend it for birds with liver disease, who are usually put on a low-fat diet (see Harrisons website for superfine, fine, and coarse high-potency pellets). This seems pretty shocking at first, and I can't think of a valid reason why a bird that's just starting to eat pellets would need to be on a high-potency formula for six months. The part about birds with liver disease looks dubious too; I'd like to hear an independent avian veterinarian's opinion about that. But it's actually possible to justify the recommendation to use it as the everyday diet. Although the fat content in the high potency pellets is double or triple the amount in the maintenance formula, the calorie content has only gone up by 11% according to the charts above and Werquin et al. How did they pull that off? Well, the protein level has increased significantly too. Protein is lower in calories than carbohydrates and fat, so to some extent the increase in protein helped balance out the calories from the fat increase. The Calories article explains the interplay between these components of the diet. The level of many other nutrients has gone up too, and by a lot more than 11%. So you're getting more nutrients per calorie with the high potency formula than with the maintenance formula. This can work as long as the bird doesn't eat more calories than it actually needs. If the high potency formula makes the bird feel full longer so it doesn't eat as much other food as it would have otherwise, that solves the problem. Eating is fun so I'm not convinced that the bird will actually reduce its food intake, but it's theoretically possible. That's what the logical part of my brain says anyway. The opinionated part of my mind says there's too much fat and too much of everything else in these pellets to feed as the regular diet. The high potency formula is fine for breeding birds and birds who need a little extra help because of an illness or injury, but I prefer the maintenance formula for ordinary situations.